While working on the second stage of the Importing SketchUp/3D Max into Oblivion tutorial we got thinking about our panoramic spheres in 3D space. Too date we have used the spheres to produce a sample high definition concept movie featuring 360 x 180 degree views of The Chapel of Peter and St Paul by Wren, Southwark Cathedral, The Painted Hall by Wren and St Giles in the Field, London. You can download the movie here (80Mb, WMV). 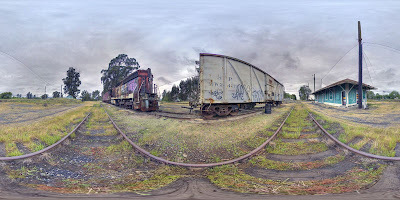 You can view the High Dynamic Range panorama (3.62Mb) in Quicktime Virtual Reality. WOW!!! That video was fantastic. I loved how you incorporated the Google Earth into and made me feel like I was in the museum looking at the paintings!! Bravo!